With Free Comic Book Day 2012 coming up on May 5th, a handful of pages were dedicated to showcasing the comics created specifically for that day. For manga publishers, Drawn & Quarterly, Fantagraphics, Viz Media and Yen Press were all present. The only work strictly manga-related (though more specifically, manhwa-related) comes from Yen Press who are publishing a sample of their upcoming adapted book, The Infernal Devices: Clockwork Angel. Viz Media’s sampler is for their upcoming original comic based on the Voltron franchise – Voltron Force. Both books will be the FCBD standard of 32 pages. You can learn more about Free Comic Book Day (a gloriously annual event!) and the comics they’re offering this year on their website. Next up is Dark Horse‘s section where the company traditionally has a batch of full-pages promoting their upcoming releases. This month they have a preview page of the second volume of their Avatar The Last Airbender sequel comic, The Promise. Volume one is due out this February and I can’t wait! It’s been a while since I’ve read Adam Warren’s Empowered series but I was pleased to see it continues with volume seven on the way. The series is hilarious, chock full of pop culture jokes and super hero story spoofs. It follows a try-hard fails-bad super heroine named Empowered and her collection of allies, enemies and weird in-betweens. 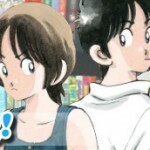 I was always impressed and extra entertained by the manga in-jokes including a healthy dash of playing around with boys’ love tropes and manga stereotypes to amusing, not offensive, effect. It’s a series I’ve got to get myself caught up on. Dark Horse’s FLCL omnibus has a preview page and a May 16th release date for $19.99/US. “The complete FLCL manga adaptation – now with bonus color illustrations and remastered story pages!”. Also in their preview section was Bride of the Water God (Vol.11) which they promote as being a “Best-selling series in the United States and Korea!”. I guess that means it’s doing well? The second volume of Blood Blockade Battlefront is promoted a bit more humbly as “Sci-fi insanity from the creator of Trigun and Gungrave!”. 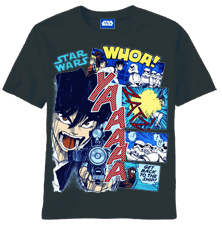 Here’s a fun piece of new Star Wars merchandise – a t-shirt with a coloured interior page from the Star Wars manga. It was released originally back in the late 90s with art by Toshiki Kudo. With the old-school manga take on the characters and the fun giant comic sound effects, I’m tempted to buy it! Yen Press‘s manga-style adaptation of Soulless made the Previews’ featured section, as did Yoshihiro Tatsumi’s Fallen Words being published by Drawn & Quarterly. Both are one-shots and definitely on my to-buy list. Soulless really caught my eye after I read the sampler they had at NYCC 2011. The art is fantastic! Fallen Words also earns the Preview magazines’ “Certified Cool” stamp, meaning books they note as being especially worth checking out. Just like when Tokyopop shuttered their doors unexpectedly quick, it’s sad seeing ads for upcoming volumes of Bandai Entertainment books. Here they have Kannagi (Vol.04) promoted which would’ve been released in March. We know from Bandai’s PR that this book has been cancelled. Digital Manga continues to buy full pages to promote select upcoming titles of theirs as well. It’s great to see the worth is there for publishers to advertise their manga to the direct market. In this month’s previews, they have full page ads for Itazura na Kiss (Vol. 08), Replica (Vol. 02), Countdown 7 Days (Vol. 02) and Moon & Blood (Vol. 03). Of the four, I’m most excited for Replica and Countdown 7 Days which are definitely hidden gems I think more would like if they came across copies. These ads may become posters on my wall after I’ve put my orders in. Onwards Towards Our Noble Death – which was originally released in April 2011 by Drawn & Quarterly – is featured in this Preview edition as a Star of the Month title. It’s another distinction in the magazine for a notable title. Yoshihiro Tatsumi’s A Drifting Life (which is going to a new printing) is also a Star of the Month. I really loved A Drifting Life so I’m glad it needs a second edition. The creator’s four other one-shots are also featured – The Push Man, Abandon The Old in Tokyo, Black Blizzard and Good-Bye – so they should all still be available for you to order into your local store. Kodansha Comics‘ has eight new volumes listed – Air Gear (Vol.23), Arisa (Vol.07), Bloody Monday (Vol.05), Cage of Eden (Vol.05), Gon (Vol.05), Deltora Quest (Vol.05), Love Hina Omnibus (Vol.03) and Sayonara Zesubou-Sensei (Vol.14). Adding to my frustration with the company, every synopsis is one generic to the whole series, saying nothing specific for the volume itself. Most are those used for volume one. It’s the same thing the company does on retail sites and even their own KodanshaComics.com. Drives me batty! I’ve contacted the company about it but haven’t heard anything back. Gon earned a special Kid-Friendly stamp while Sailor Moon (Vol.01) is re-listed as another Star of the Month. Next up in the alphabetical publisher listings is Seven Seas Entertainment. They’ve got listings for Blood Alone (Vol.06) and Toradora! (Vol.04). Both volumes are listed at $11.99 which is a one dollar increase from the original $10.99 that the first two volumes had – I hadn’t even noticed the increase when I bought the third books. Uneven as the singles look next to the omnibus volumes on my shelf (I can’t help it, must be even! ), I’m really eager for the new Blood Alone volume as they come out. UDON Entertainment has a full page promoting the first volume of their upcoming Captain Commando manga. It looks and sounds pretty hilarious, touted as “The Return of Gaming’s Greatest Hero!”. It stars a “fighting force” consisting of Ginzu the Ninja Commando, Mack the Mummy Commando, Baby Head the Baby Commando and their fearless leader, Captain Commando. UDON hasn’t updated their own website in a while with schedule info so places like Diamond and online retailers have been the only real source for release dates. Next up comes the Viz Media section which is usually a hefty multi-page addition to Previews. This time is no exception but it’s sad to see that almost all the artwork used is really low quality. It looks all grainy and pixelated. This isn’t a norm from them so I can only assume something went wrong between Viz and Previews this month. They’ve got a full page for Pokemon Black & White (Vol.05) and Voltron Force, then two-per-page splits for Blue Excorcist (Vol.07), Bakuman (Vol.10), Bleach (Vol.39), Rosario+Vampire: Season II (Vol.08), Nura Rise of the Youkai Clan (Vol.08), 20th Century Boys (Vol.20), Tenjo Tenge (Vol.06) and X 3-in-1 (Vol.02). It’s nice seeing the Will Eisner stamp next to 20th Century Boys though I do wish Viz Media would mix quotes up a bit – it’s getting old seeing the same Junot Diaz quote in every book and ad. All their other titles due out in March are listed with cover images, info and mini synopsis’s on a single page at the end of the larger preview sections. So many books! You can see the complete list in this month’s Manga Previews PDF. Vertical Inc has three books listed – Drops of God (Vol.03), GTO: 14 Days in Shonan (Vol.02) and Twin Spica (Vol.12). This volume of Twin Spica is the last of the series and clocks in at a whopping 400 pages! The eleventh volume out this month also has 400 pages and while I’ll be sad to see the series end, it looks like it’ll be an experience to savour with two extra large books seeing it out. Yen Press is the last-up with eight new books scheduled for March – Soulless, Bamboo Blade (Vol.12), A Bride’s Story (Vol.03), Bunny Drop (Vol.05), The Melancholy of Haruhi Suzumiya-chan (Vol.05), Pandora Hearts (Vol.09), Spice and Wolf (Vol.06) and the newly begun, Is This A Zombie? (Vol.01). Is This A Zombie is listed as their Spotlight On title. Seeing the cover of Bunny Drop (Vol.05) with Rin now a teenager makes me fearful for that ending everyone is often complaining about. I’ve been assured it still sticks to its quality coming-of-age and family drama right up until the end though so I’ll be with it until the end! The synopsis for A Bride’s Story (Vol.03) also shows that the story will be shifting onto Mr. Smith for a while and his journeys away from the village we’ve be in so far. Listed in the back of the Diamond Previews are the top selling titles from a variety of categories based on several months of sales tracking. This month they have the results for November 2011. Sailor Moon (Vol.02) also made spot 8/10 on the overall Top 10 Graphic Novels & Trade Paperbacks list. Nostalgic shoujo manga up there with the superheroes and zombies, and in the direct market as well. Great to see! 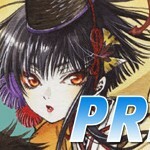 That’s it for the manga-content of Previews January 2012. If you’re interested in browsing through all the comics, anime, toys and games scheduled for March(-ish), I recommend going to your local comic store and picking up a copy. Until next month! Well… for a new Previews post anyway.